The propagation on 10 m is getting very good. Earlier this morning the signals were S9 in the LZ DX contest. When I came back on 10 m, the signal of 9H1XT was S9 + 20 dB and sounded very strong. I used repeatedly 3.6 mW to answer. I had to force me NOT to increase the power, every time John did not hear me, but answered an other stations. After 7 or more times my perseverance payed off and the QSO was made with 3.6 mW. Tnx John. It is a long time ago that a power of 5 mW or less could be used. This reminds me of the propagation in 2001, when I could frequently work over thousand miles with 2.5 mW or 5 mW. Last weekend I participated in the OK-OM DX contest. Saturday I started on 80 m and made 23 QSO with 2.7 W. Sunday morning I made just more than 10 QSO's on 40 m. The propagation was disappointing on 40 m. Often I can use just 80 mW on 40m in the morning. But in nearly all the QSO's, I had to use 2.7 W. Only one QSO could be made with 360 mW. Then I went to 20 m. It was fabulous. I started with 360 mW and later I could reduce to 8 mW in a QSO with OM3IAG. The stronger the received signal, the further the power can be reduced. I received OL2W and OK7T with 20 dB over S9. This is S9 through the 20 dB attenuator. I noticed that OL2W and OK7T are great listeners with Excellent Ears and both really took the time to answer my 8 mW signal. For years I am a member of the NAQCC. (#2038) The NAQCC club activities are dedicated to QRP and QRPp operation, using CW. When I visited the Award page in August 2011, I got excited by the extensive Award program for QRP and QRPp. Over the years I have made hundreds of confirmed QSO's with more than 1000 Miles per Watt, but untill now, I had not yet applied for an award. So I decided to apply for the 1000 MPW Award. I choose to apply for the QSO with the highes Miles per Watt. This QSO with RT6A was made in the Russian DX contest in August 2007. 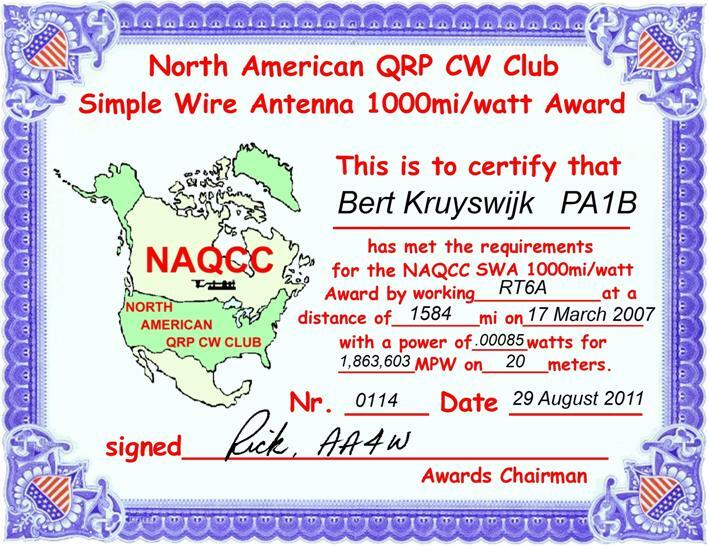 A few days later, I recieved the beautifull NAQCC Simple wire antena 1000 Milies per Watt Award, sent by e-mail, from the Award manager, Rick AA4W. 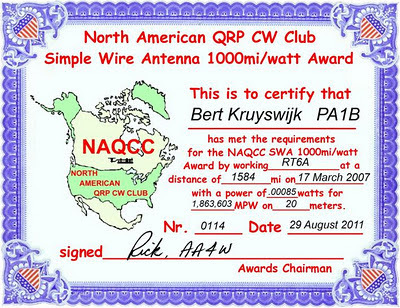 Bert, PA1B (NAQCC # 2038), claimed our most popular award in August. The 1000 Mile Per Watt award. But Bert didn't stop at 1000 miles/watt or even 3000 miles/watt, he worked RT6A, from his home in the Netherlands, at a distance of 1584 miles while transmitting .000085 watts (0.85 mW). This calculates to 1,863,803 miles/watt! And he has the QSL card to confirm the contact. Bert has been experimenting and operating at the Milliwatt level for quite a few years. His motto is: "As the S-meter goes up, my power goes down". He uses step attenuators on the output of his Yaesu FT-817 transceiver to give him accurate stepped outputs from 5 watts down to 5 mW. His web page http://a29.veron.nl/pa1b-07.htm tells a wonderful story of his exploits at the Milliwatt power level and he has loads of information about his homebrew attenuators at http://a29.veron.nl/pa1b.htm. Bert has set the bar for any of us to try some Milliwatt operating. I had great fun in the Ukrainian DX contest with low power. The 20 m, 15 m and 10 m bands were doing very well. I used a power of 2.7 W down to 36 mW and an Inverted Vee. I used the lowest possible power in each QSO. I love these DX contests, in which I can work any station that I want. I found out that 20 meters is still the best band for milliwatting. I took part in a major contest for the first time with the microphone. In my entire HAM career I made a few phone QSO's on HF. As a 100% CW operator this was a big thrill for my. to 2.7 W, but I still managed to make QSO's in SSB. It was hard work with a fixed power. when my signal is not heard. In this CQ WW DX contest I worked 17 DXCC countries in 29 QSO's. In total 15 European countries, Canada and the USA.